A summer tote bag filled with sunscreen, visor, magazine or novel and sweet & salty snacks,etc. A scrapbook or memory jar: Have parents send in a picture of their child along with a favorite thing they learned or memory about “Ms./Mr. Teacher’s” class this year. 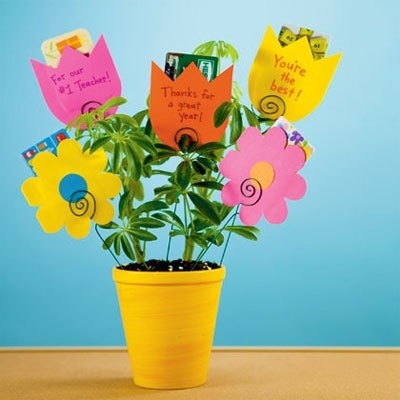 Always enclose a note from your child to the teacher thanking them for a great year, in their handwriting if possible. Such cute and creative ideas! Wonderful ideas, Sandra! Where were you and these ideas when I was searching for teacher gifts when my children were in school! Thanks for your encouragement. I think the gift card (home improvement, gas, etc.) or money idea is very suitable for a male teacher, as well as the baked goods. Just had this thought, a “carwash bucket”. Take a bucket, sponge, microfiber towel, carwash soap, & Armor-all–a handy gift anyone could use. A note from her/your family is always nice to include too. Hope this helps!